From Bavaria the band Grand Sermon hails and MDD Records presents their debut album which is lyrically based on Dante's Inferno, the journey from hell via purgatory to paradise. Sepultura already presented this topic on their album Dante XXI, so it's nothing new, but at the end of the day the bands musically differ a lot - and it's still a great story which seems to be made for extreme metal. 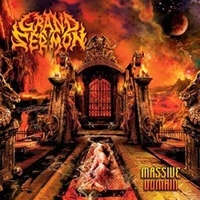 Grand Sermon deliver an infernal technical, brutal death metal - the American way. Instead of speed they present very heavy grooves and mid-paced parts, but they also storm off into some blast parts. They sound very heavy and extremely brutal, they steam roll you with blast beat attacks - and only scorched earth is left behind. They use blast beat attacks wisely and so they seem to be even more intense and brutal. Brute power grooves and dominating double-bass passages ennoble their sound and there is a dash of Six Feet Under in their songs, especially at Bangs Of Acheron and Cerberus. You might not think about technical death metal when you think off Six Feet Under, but it's this dash of SFU which makes Grand Sermon special. The band is playing on a high technical level - without being too complex - and even have something catchy... All in all they deliver brutal death metal straight in your face, but with twists and turns. Very entertaining. Fans of Immolation, Suffocation, Necrophagist and Morbid Angel should add Grand Sermon to their list of wishes!